Aqua (water), glycerin, glyceryl stearate SE, carthamus tinctorius (safflower) seed oil, sesamum indicum (sesame) seed oil, cetyl alcohol, dimethicone, ethylhexyl stearate, cetearyl alcohol, butyrospermum parkii (shea butter), persea gratissima (avocado) oil, simmondsia chinensis (jojoba) seed oil¹, vitis vinifera (grape) seed oil, aloe barbadensis leaf juice¹, camellia sinensis leaf extract¹, chamomilla recutita (matricaria) flower extract¹, cucumis sativus (cucumber) fruit extract, echinacea angustifolia extract, lavandula angustifolia (lavender) extract¹, allantoin, panthenol, tocopheryl acetate, lecithin, polysorbate 60, potassium hydroxide, xanthan gum, alcohol¹, benzoic acid, dehydroacetic acid, phenoxyethanol. An exquisitely light, unscented, natural body lotion packed with rich botanical emollients to soothe and soften skin even very sensitive skin while providing 100% daily hydration*. Alba Botanica Very Emollient Body Lotion blends aloe vera, green tea and chamomile extracts plus antioxidants to nourish and replenish skin on contact. Perfect for use in massage. 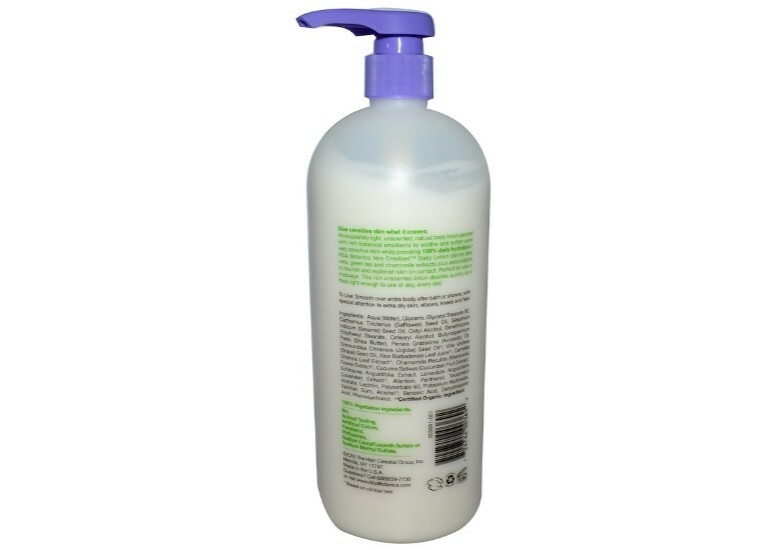 This rich unscented lotion absorbs quickly so it feels light enough to use all day, every day.